She is the most beautiful person in the world. The one who makes us feel most loved despite our faults and shortcomings. A woman who has the ability to touch our hearts like nobody else can. Who am I talking about? Mom, of course. Mother’s Day is right around the corner (May 11th, this year!) so if you’re still trying to figure out how you will lavishly spoil the best person in the world...no need to worry. I have diligently combed the web for some of the best places and fantastic treats for mom and I’m willing to share. First on the list is: buy her the BEST CHOCOLATE IN TOWN. Nothing beats the satisfaction that you get from chocolate, in fact, in the instructions for the care and feeding of a mother it explicitly states that chocolate is a highly recommended supplement for the relief of stress (which you probably caused) and overall health and happiness. Here in Indianapolis, you can find the best chocolate in town at 880 Massachusetts Avenue. They are open Mondays - Saturdays (11 am – 7 pm) and Sundays (12 – 5 pm). There is a wide variety of sweet treats that you can choose from. Truffles, pies, gelatos, or just a simple but delightful cup of coffee; you name it, they’ve got it. Mom is bound to feel spoiled by this treat. Also, you could buy them and bring them to her, of course, but this adorable little shop sits right on Mass Ave, near all the great boutique shopping and delish dining options on Mass Ave, across from Indy Reads Books and next to the Mass Ave Wine Shop...Need I say more? It’s a destination gift all the way around. Next up, lets talk about a gift which might address the fact that being an outstanding mom is no easy chore – physically, mentally or emotionally. Thus, a massage is one of the best indulgences that you can offer her. A ‘pamper yourself day’ at Elements Massage will surely afford her some well-earned relaxation and peace. Elements Massage provides a variety of different message types,tailored to your preferences. 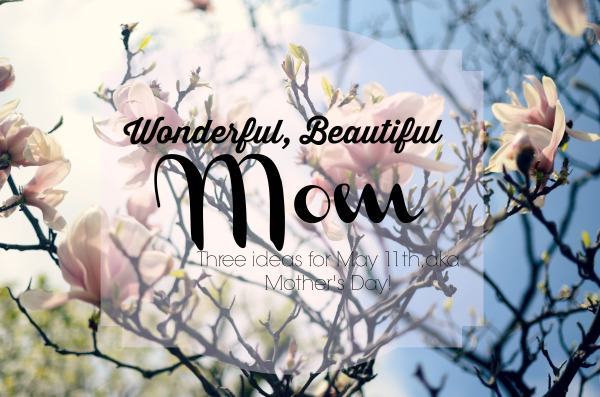 To give your mom this relaxing experience, you can visit them at North Clearwater Shoppes Shopping Center here in Indy, or purchase a gift-card online. Last but not least; treat your mom by feeding her imagination with the finest dream house in town. Provide a day of wandering a Pinterest-in-real-life home and let her spark her nesting creativity; send her to the Decorator’s Show House and Gardens . Let me just add that this is a gift which keeps on giving, if you will. Tickets to the event support the St. Margaret’s Hospital Guild. The home show is located at 5235 North Meridian Street Indianapolis, Indiana. This year, it will be open on April 26 – May 11, 2014. Most of all, don’t forget to tell her thanks for her unconditional love and express gratitude for all the sacrifices that she’s wholeheartedly made for us. Give mom a big hug to start the day right.